Summer’s of L&S’s Next Performance.. I hope that this e-mail finds you “In Good Spirits”. I am sending this e-mail for 2 reasons. First, I want to thank you for being interested in my life outside of work and being supportive, even if just by words, regarding me being a vocalist. I have been a professional vocalist for a little over 17 years and it is truly what makes me happy. Everyone asks when my first show of this year will be and it is finally here. 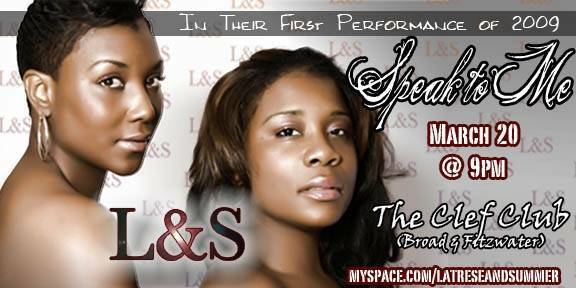 If you have never heard L&S perform, we are a very sultry and soulful duo – compared to the Emotions and Zhane, because of our seamless harmonies and outstanding songwriting. Please come out if you can…Otherwise there will be PLENTY of shows to come. Hueman- Prepare to be immersed whole heartedly in pure harmony because his voice encompasses the testimony of all time. Dinner and Drink Menu Available, S2M Drink Special and FREE PARKING. Bet. 8th Ave. (F. D. Blvd.) & St. Nicholas Ave.
FOR LIVE TAPED PERFORMANCES, GREAT FOOD & SOULFUL SOUNDS! We are having our first open casting call of the year to cast for four movies. We are looking for lead and supporting roles for all of these movies. Our lead and supporting roles are all paid roles. Keep in mind we are still low budget, so don’t think we’re paying enough for you to quit your day job. All other roles are non-paying and credit only. Meals and copies of movie will be provided to all those involved in the making the project. If you are interested in becoming a part of any of these productions please come to the audition with a prepared monologue no longer than 2 minutes. Our first production FOR THY LOVE 2: LOVE HURTS begins production in April. We are looking for all types generally in the age range of 18 and up both male and females. However, we do have roles for children coming up in the very near future just not at this casting call. We will contact those who we feel are best for each movie to come in for a read-around a few weeks before production starts and offer them the role we feel is best. All filming is done on the weekends. Looking forward to seeing you there! NOTE: We are not accepting any video auditions at this time, please come in person and audition to be consider. in Atlanta performed everywhere from Centerstage to the 14th St.
Playhouse, in shows like “SOULKISS” to V-103’s “PASSION & POETRY”. own words…she is OZARA ODE! We will have a brief town hall forum on the state of the Music Industry. We will take advantage of the vast knowledge of established artist and industry professionals that frequent our events. As always, you never know who may stop by and give us all some great advice!!!! Dancing, Food & Cash Bar and FUN!! THIS YEAR BE ON THE LOOK OUT FOR NEW ARTIST, BUSINESS & VIP IN THE COMMUNITY SPOTLIGHTS. AS WELL AS, THE RE-LAUNCH OF WWW.SINGLEMOMMAS.BLOGSPOT.COM & DIVADOM ENT. GROUP’S NEW ONLINE MAGAZINE: D.UNDERGROUND MAGAZINE WITH AN EXCLUSIVE INTERVIEW WITH DJ TRAUMA! If you would like to have your business and/or event advertised or spotlighted in our newsletter, please contact our director of promotions and marketing at larry@divadoment.com , for more rates and information. SXSW is drawing upon us and it’s always hectic getting all last minute details together on all the cool parties, shows you absolutely can’t miss, the artists I’m repping and trying to meet with folks I want to meet for new business and overall networking….Not to mention- all the great panels and roaming the exhibition booths…. With that said…..There seems to be tons of World Music this year which I’m excited about and a large overseas contingency…So I don’t feel bad I missed MIDEM this year….MIDEM folks are at SXSW….. Womex is all over SXSW this year too with a stage and panel…. Also, my Severe 70 hottest buzz bands must sees! Published in Digital Media Wire. This is the 3rd year my hot list is published…. So check out what’s happening at SXSW. This will be my 20th or so year….Lost count really! One dedicated SXSW Soul showcase which mixes some of the best Soul and Hip Hop artists under one roof. Other soul acts I’m excited about down there. Zaki Ibrahim, Yarah Bravo, Janelle Monae, Eyeris, Peter Hadar and Alice Russell. She’s back in NY at Blue Note which will be a sold out show I’m sure….Friday, April 3rd- Late Night Groove Series…11:30PM…. Over 35,000 spins for ‘ My Love’ on Youtube and Wayna will be hitting The Congo for a festival early July…. The 3rd Annual Urban Meet and Greet is going to be a great hang for all the Urban heads rolling through Austin.. It’s all about building/networking with great music…. Brought to you by Foundation Media, Spectre Music and The BRMG Group…. Great sponsors down to help the event with community outreach and great socializing…. Thursday, March 19th…. 3PM-6PM Barcelona. With the rapid growth and accessibility of digital technology comes the chance for artists worldwide to get their message out and their music heard. They are not singing about girls and money, but about political strife, economic crises, and real life issues they face every day. Join us on Friday March 20 to explore this phenomenon and how it is creating social change. This panel, moderated by Ben Herson, CEO of Nomadic Wax, will feature the women of the Muslim hip-hop/spoken word duo Poetic Pilgrimage – Sukina Abdul Noor and Muneera Rashida. Mark LeVine, author of Heavy Metal Islam, filmmaker Magee McIlvaine and myself will also offer insight. Should be an interesting discussion…. See you there! This all goes down at Lucky Lounge — DJ Melo X on the decks mixing the entire event and bringing the tasties.. Please check The Bloom Blog for full line up! I’ll be in Austin but wanted to spread the word here. I’ve been a fan of Art For Progress for a few years now and supported their Cause. Come see great art- witness a diverse array and spectacular views of the Hudson River. Sponsored open bar and light food. Saturday, March 14th 7:30PM 320 Studios. Have to shout out Miz Metro in music who didn’t make the finals but she did get an honorable mention. Next year! To purchase tickets log on to Art for Progress. All the way from Paris, France- this progressive free form Jazz collaborative called EOL TRIO will be rocking in U.S making their debut in NY and at SXSW. They’re also performing tonight in Toronto at Canadian Music Week. EOL TRIO have a debut album called Mister K which mixes electronica fused with funky atonal jazz chords and improv. Made up of 2 brothers- Dennis Girard and Xavier Girard and Laurent David who also plays with Yael Naim. EOL Trio will be playing in NY on Tuesday, March 17th at DROM. 7PM LiveWired acts Ka’a Davis and M.Nahadr will also perform…. EOL TRIO go on around 8PM… DJ Lovolution on the decks with the musical treats. If you’re into improv, experimental, progressive and electronica- or if you’re a straight up jazz fan- I recommend you check them out….Who knows when they’ll be back as they’re touring requests overseas are very Extensive. So that’s my SXSW Edition….Hope you enjoyed the read and more importantly hope to see you in Austin for some networking…. Would love for you to come to my events- no need to RSVP- just show up…We love you! Red Bull Moon Tower- someone hook me up! Perez Hilton- Need a hook up! Otherwise I’m straight on all the party action!!!!! BBQ, Booze, Music, Friends and Discovery…. That’s SXSW for you! If anyone has any leads on SXSW tips/party invites they want to share- holla at this chick right here!!!! This email was sent to mike@lifeandsoulpromotions.co.uk by fiona@thebloomeffect.com.